My primary responsibility at my internship has been support of their new Ethnicity and Religion committee. At my first meeting with this committee, we discussed their previous workshop and goals for the upcoming workshop. During the conversation, it was decided that a deeper understanding of British colonialism’s legacy was needed. We would focus on this time period up to the riots of May 13, 1969. When I asked about the possibility of readings or journaling before the next workshop by members committed to this focus, I was discouraged. Apparently, in general, Malaysians do not enjoy reading. Today video is such a powerful educational tool. I wondered if some images and sounds could make this history more appealing and attainable. So, I offered to compile this history and make my first video. Well, needless to say, I did not go as far as I wanted to (to teach myself Flash), but I did pull together a pretty nice PowerPoint presentation. For the past 3-4 weeks I have been reading many resources to better understand Britain’s draw to the Malay peninsula. I learned how it began by taking control of major ports. Then it manipulated the sultans and gradually took power from them, leaving them to govern only religion and customs. Driven by market demand for Malaysia’s resources, Britain used it’s colonial ties to bring in laborers from India. 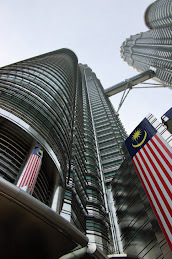 Many Chinese were already in urban centers in M’sia, many in the mining industry. During WWII, Japanese occupied Malaya but Britain reoccupied with Japan's surrender. The 'emergency' began shortly after as people in Malaya wanted independence AND as a way to rid the country of communists. As Britain prepared to hand over leadership to the locals, Malays were concerned about all these laborers who now considered Malaya home. UMNO formed and worked with the British to form the new constitution. Eventually the Reid Commission declared the date for independence as 31 Aug, 1957. Between this date and May 13, poverty continued disproportionally along Britain's 'divide and rule' lines. Throughout this history, I kept three things in mind: ethnicity, class and gender. How were women affected by these changing structures? How did British structures divide and perpetuate classes and ethnic groups? I found this exercise very challenging. Some resources were very biased. Who writes history? What history is taught to Malaysians today? I also had to edit for time, not wanting to bore people. This forced me to be selective, in essence altering the telling of the history through my lenses. In the end, I scanned several photos from pictorial history books and also searched online. Judith also helped me find appropriate music. The final presentation ran about 20 minutes. 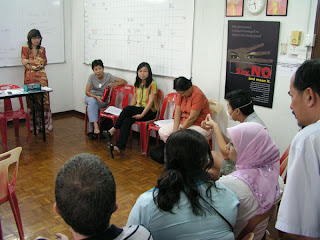 Our third Ethnicity and Religion workshop was held this past Saturday. About 22 people attended. Though I was concerned about the program and timing, I had to smile at the irony of my stress. The day before, I worried about the arrival of the guest speaker, as his time is so valuable. But on the actual day, people arrived in time for us to begin 15 minutes late while I was switching from one laptop to another (and struggling with other minor technical difficulties). The entire program ran behind with our ice breaker lasting well over 10 minutes, but oh, they were having fun! After my presentation, we filled spare time (guest speaker had not arrived yet) by asking for feedback. When Dr. Syed had arrived, he led us through this same history up through present day. 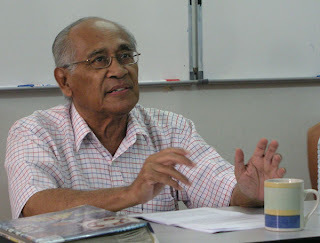 He has written recently on ethnic relations in Malaysia. Still running over time, the audience eagerly asked questions. I found these particularly intriguing, partially because his history telling was all review for me (only a few points were new). Our schedule change caused us to miss our tea break, so I was so thankful when we wrapped up by 5:30pm so I could eat (I had not eaten since 10:30 am). The food was fabulous, as was the chance to speak with the participants informally. This new focus by my feminist NGO is bold and unique. Many people don’t fully understand why they have chosen this direction. But there is much tension in Malaysia today. Unfortunately, much of its roots lie in the ethnic ‘divide and rule’ policy the British established way back when. And as of late, religion has become increasing politicized. Our NGO recognizes the need to engage its members and society in dialogue about these issues in hopes of preventing violence and perhaps bringing about change (though it will not be easy with the given hegemony, NEP, ISA, sedition acts, etc.). Live and study in one of the most dynamic regions of the world, one touched by both the unprecedented economic growth of the "Asian Tigers" and the uneven social changes brought on by the pressures of globalization. On this program, you will observe how the many different social, religious, and ethnic groups in Southeast Asia have responded to these pressures and gain an understanding of what is being done to combat the accompanying threats to their regional security. I am a Food Tourist...and I love it!